This past Saturday, at the recommendation of our friends, we went to Saxapahaw to watch a band, relax, and visit a farmer’s market. 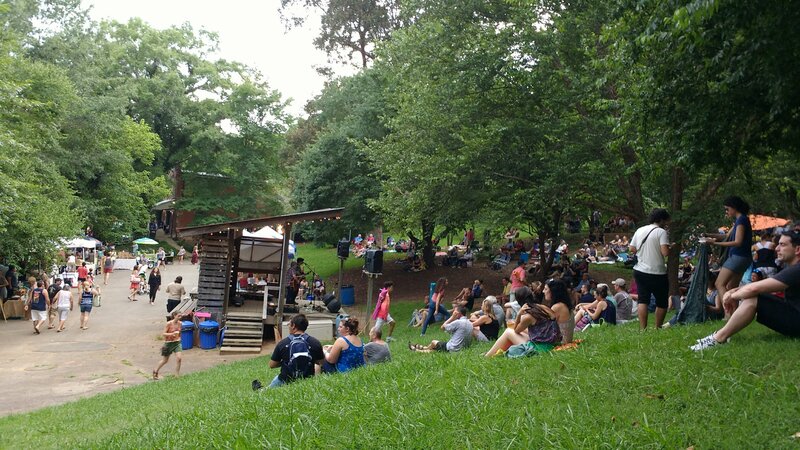 Called (descriptively) Saturdays in Saxapahaw, the relaxed outdoor concert featured lots of families on blankets, plenty of coolers, and no dogs, as dogs were (for some reason) not allowed. We had a fun couple of hours, before the rain started, walking the farmer’s market, getting ice cream from the Maple Valley truck, and admiring the sheer number of hippies. I saw a lot of cute dresses. And one gentleman came dressed for the heat in a mohawk, booty shorts, and a tank top. I envied his confidence.